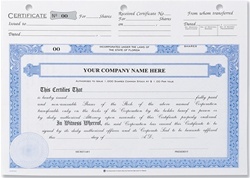 Personalized Membership Certificates are included in your Corporate Kit. These artistically designed certificates are printed on fine high-quality heavy-weight linen paper. Set of 20 Top stub certificates printed on security paper. Set of 20 big board certificates printed on security paper. Separate stub sheets are included for your convenience. 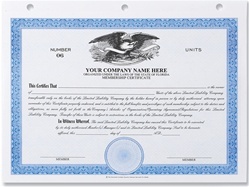 Set of 20 big board eagle certificates printed on security paper. Separate stub sheets are included for your convenience. Available in blue, Green & Brown.